Gemini Square New Size 5 Gallon - Peabody Engineering & Supply, Inc.
Peabody Engineering introduces it’s newest tank to it’s line of Gemini² Dual Containment® Tank System – Our Gemini Square 5 Gallon Size. This square tank is designed with pump mounting surface, fittings per spec and 8” vented twist lid inspection port–non vented twist lid available. Recessed Mousedoor at bottom of tank for easy installation of bottom bulkhead for flooded suction draining. Available in Blue or Natural. The tanks are made in LLDPE and HDLPE and are WQA Gold Seal NSF/ ANSI 61 compliant. 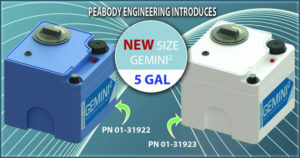 To see the complete line of Gemini² Dual Containment® Tanks go here for more information http://catalog.4peabody.com/product/gemini-square-dual-containment-tanks-2/ or call customer service (951) 734-7711 to order.